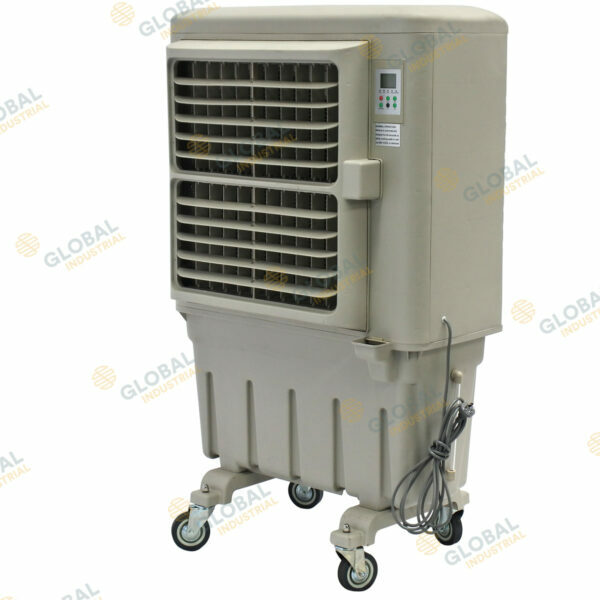 The Global 8000m3 Evaporative Portable Air Conditioning Unit is designed for small to medium workshops, factories and most industrial applications. This evaporative cooler is compact and this smaller footprint than traditional units also makes maneuvering an easy task while and, at the same time, keeps the waste of space to a minimum. The construction is of high quality and is made from UV stable plastic giving the unit long life and durability in industrial applications. This particular air conditioner unit contains the ever reliable axial fan and CELdek type honey comb pads to ensure effective and reliable cooling. Multi directional louvres control a steady flow of air in the chosen direction while the variable speed inbuilt control unit allows you to adjust the speed of air flow required. 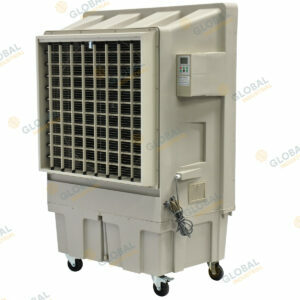 The Cooling capacity is 8000m3 per hour, the tank holds 60L and uses 4 to 6 litres p/hour. The dimensions are 1400mmH x 860mmW x 500mmD.